1. Not all of it is 100% water proof! There are products that are labeled 100% water proof, and others labeled water resistant. Water resistant to me = Not Water proof. 2. All the boxes of flooring sell for about the same price at Home Depot and Lowes. What does vary is the square footage in the box! Some product had 15 sq ft in a box, others had as much as 27 sq ft in a box! 3. All of the product says just score it and snap it. Easy peasy. Well, bring your razor knife to the store with you and score some of the samples. One product I really liked was thick at 7.5mm. I can tell you it was almost impossible to score and snap. I ended up buying a product that was less than half the thickness. 4. Matching waterproof moldings and transition pieces: this can be a PITA, depending the pattern you pick. I'm still working to round up stair nose for the transition between the vertical wall on the front of the dinette to the horizontal floor on the dinette. 5. You don't have to get it down to a bare surface, but it does need to be level. I pulled out old glued on carpet. Ugh! On the areas that would be exposed, I used acetone to remove all of the glue. But on areas where the floor was going to be laid, I just used a scraper to knock off the high spots. 6. The Shaw product I used is a free floating floor, no glue. I'll be gluing the quarter round, but not to the floor, just to the walls. It’s in. Just one piece left (1 sq ft). So I used 25 sq ft. Now no pieces are spliced. Each run is its own piece. So I probably wasted 4 or 5 sq ft total, probably a little less. Mine was 3.2mm thick. We need PHOTOS! Pretty please... Sounds like you did a wonderful job though. Resort Teak is the color. I wanted something on the lighter side. I will use the poly styrene moldings in a light oak (pretty good match color wise). I have been pleasantly surprised how good a fake wood vinyl product can look. I don't have any before pictures, but it was the hideous red shag carpet others have posted before. 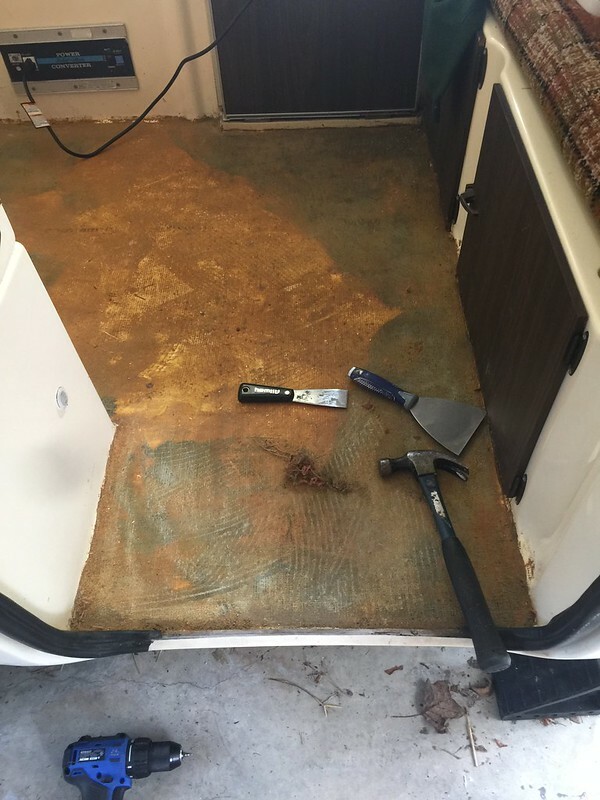 Once the carpet was pulled up, I had a mess of mastic. I totally removed it with the help of acetone and a green scrub pad on areas that were going to be exposed: mainly the curved area in the dinette and the short vertical wall step up in front of the dinette. The rest I just used a hand scraper to knock down the worst of it. Very nice job bill. Apparently Shaw makes a matching stair nose that would probably have to be glued on to the vinyl click flooring at the front edge of dinette. 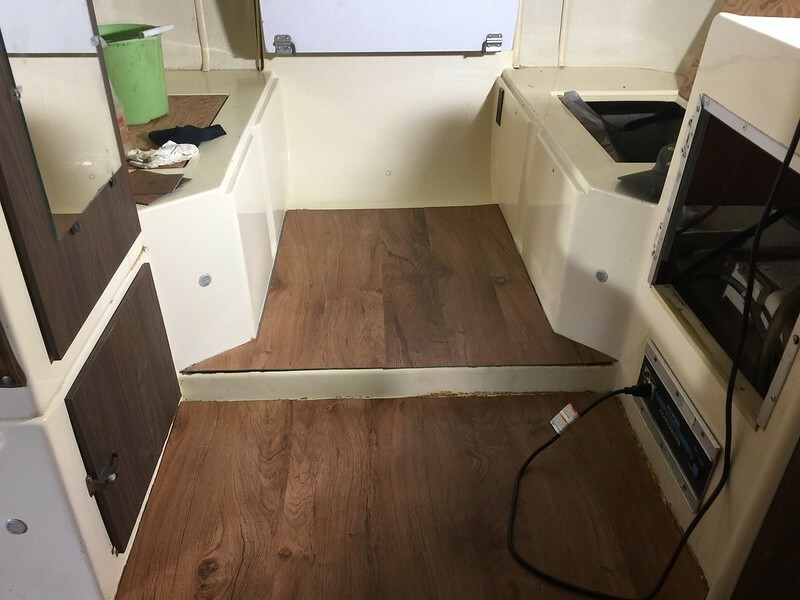 I am interested in this flooring product and also the waterproof fiberglass backed floating sheet vinyl flooring products on the market for our Boler 17 reno. In our Trillium 4500 we currently have a couple of washable rugs on top of 1/2 inch thick black foam interlocking tiles. Keeps the floor warm during cooler hours/days. I installed click type flooring in a bedroom in my house. Now I would never use click type flooring in my trailer. Click Vinyl is installed by inserting a tounge into a groove at a 30 - 45 degree angle and swinging it down along the finished edge wall. To do that, the edge piece has to be cut amost half of an inch short of the wall. In a house, the Gap is covered by baseboard and quarter-round. 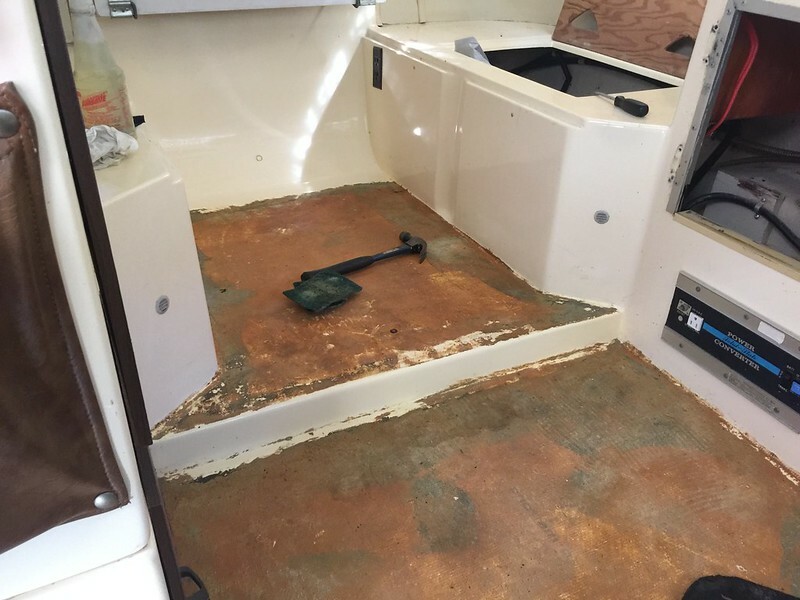 You can't cover the Gap in a trailer that has no baseboard or quarter-round. Also gaps are required around some corners. With all of that I suggest that a glued joint type of flooring can give a better result. I had none of this problem. I started 1/4 inch away from the kitchen cabinet and worked across to the door. Easy. I used polystyrene cove which more than covered the gap. I’ll have to measure but it was about 5/8 inch. I laid it out front the door inward so I had a full width at the door and about 5 inches wide at the kitchen cabinet. Then I reversed direction for easy snap in place. I really only left a gap for expansion. I could have just as easily had it tight. The corners in a Trillium are somewhat rounded. With a pair of scissors I rounded the flooring corners. On the cove I relieved the backside of each corner to allow for the rounding. 1. If you are going to use cove and plan to use an adhesive, install the adhesive to the fiberglass wall, not to the cove. If you apply to the cove there’s a good chance you will make a mess (don’t ask how I know)! 2. Don’t put cove in front of the doors on the gaucho. First there is nothing to glue to except the floor and I didn’t want to do that. Secondly the doors go down to the floor so any molding is going to catch everytime you take something out through the gaucho doors. The lower door beneath the closet has a fiberglass lip that is higher than the cove so I put it there. I’ve got to order a piece of stair nosing for the front of the dinette and then I will be done (with this project, the first of many)! Home Depot sells a flooring called Allure that does not need perfect flat floor to install and it is a floating floor. It does not click together. The clicking flooring has a tendency to unclick so you are always reclicking it. The Allure is thick and each piece sticks to the next. Of course you have to cut pieces at the end walls so the seams are not in line. We did our 600 sq ft living room/dining area, 144 sq ft in kitchen and over 400 sq ft in family room with the Allure. After we did each room we loved it more and more. You can score it and break it at the score. We helped the floor layer by scoring and breaking a lot of the pieces. Of course the samples would not cut and break since they are so tiny. The floor is essentially water proof since each piece glues to the next piece on the ends and sides. It is all pre-glued so you are not gluing any of it. If I ever need to replace the carpet in my Casita I will use the Allure and do it myself since we helped and learned from the floor man. I purchased click flooring but havent yet installed it. Ive since read that many people have not had luck with click, and that the flooring must be glued. Perhaps that’s from northern extreme cold users (that includes me in Canadian prairies). I’d thought I’d use construction adhesive when I get around to installing. I installed the Allure with the glue strips in my Scamp a couple of years ago. I'm in Michigan most of the year, with trips to Florida. I've also Installed the click connect Shaw flooring in my house. I'm happy with both. The click type does need to be re clicked occasionally, especially the ends of the planks. Be very careful gluing these floors down. The are meant to float, to allow for expansion and contraction. A few months ago I left my full glass stormdoor closed, with the afternoon sun shining in. About an hour later, I noticed a large "bulge where the flooring in the direct sun expanded but the surrounding floor had not. It flattened back out when I closed the interior door, blocking the intense sun. All this to say, these floors do need to be able to move around. I'm sure a small area of glue occasionally in a particular problem spot might be ok, but not gluing it all down. I think that would be asking for trouble. This type of flooring is not meant to be glued down. It is called a floating floor. It needs to move some with the temperatures. Gluing down may give you some real headaches. Go with the Allure flooring that glues itself to each piece. It can be found at Home Depot. We've done over 1200 sq ft of it in our house and it is wonderful. It is about water proof since the sides and ends glue to the next piece. Leave about 1/8 inch on each wall side and end for the floor to move if need be for the change in temps. Do not put molding tight to the flooring. Just let it barely touch the flooring. The click type will unclick especially when pulling the trailer. If it unclicks that would make it totally not water proof since the water would go into every spot that isn't sealed. I have not seen the click type flooring at Home Depot. We did go to Lowe's and saw it. Our floor guy said to use the Allure especially if our floor may have imperfections or high and low spots. It does and the Allure forms to these spots. Home Depot's flooring that looks like what you have is Allure and it glues itself to the next piece at ends and sides. We love it in our home. Since it glues itself to the next piece it is most likely not 100% waterproof since I'm sure there are minute cracks where the pieces join together but it is likely not to let water in unless you leave it standing for quite a while. If you got a lot of water such as a broken pipe flooding it is easy to pull up in a solid full piece and let it dry at the bottom. 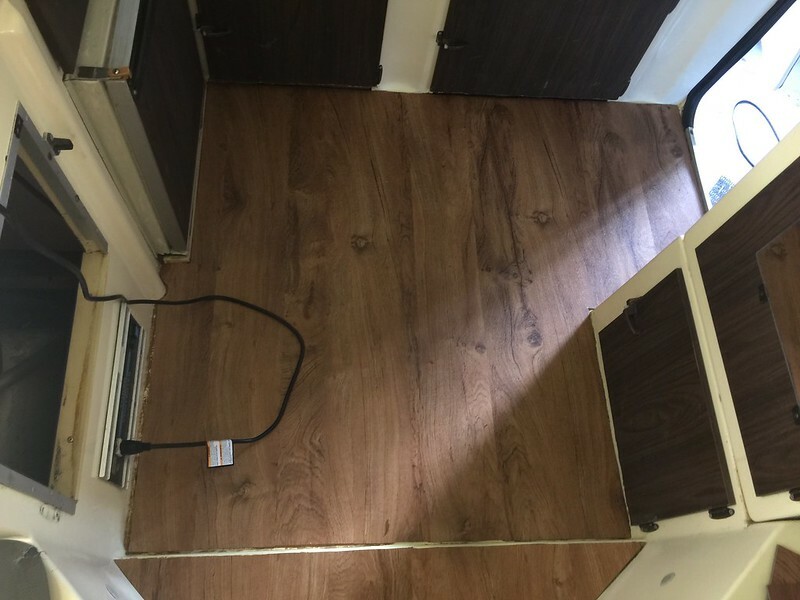 Since the trailers are so small you could pull up the flooring by removing the moldings and lifting the entire floor area out.